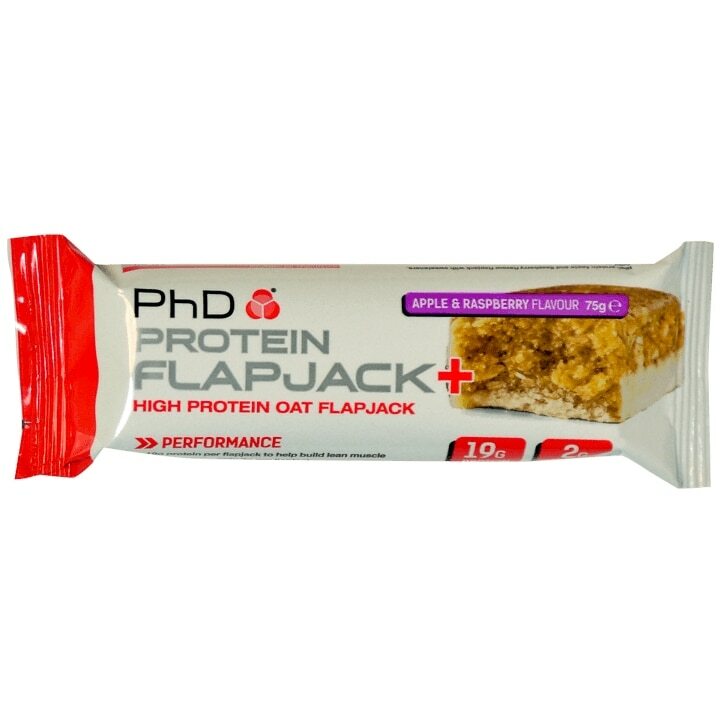 PhD Protein Flapjack+ is an ideal snack for any athlete looking to increase muscle mass and help replenish the body with quality, healthy calories after a hard bout of intense exercise or throughout the day to support an athletic lifestyle. Any individual embarking on a serious training plan requires quality, hard-working calories that fuel the body and allow performance to be optimised. Providing 19 grams of protein and featuring the versatile benefits of premium quality whey protein and milk protein isolate, PhD Protein Flapjack+ utilises finest rolled and malted oats for a sustained release of complex carbohydrates. PhD Protein Flapjack+ contains less than 3g saturated fat, rather than the high fat content of regular flapjacks that are traditionally coated with margarine, vegetable oil and butter. Protein Flapjack+ also contains an amazingly low 2g of sugar, which is exceedingly low for a flapjack that tastes so good. The taste, texture and great convenience delivered to you by Protein Flapjack+ means that you can eat one at varying stages of the day, without sacrificing a healthy diet and nutritional plan. Great for a pre-workout, high protein snack, Protein Flapjack+ can just as successfully be used after a workout, or as a healthy alternative to breakfast, or mid-morning snack. Consume up to 2 PhD Protein Flapjack+ bars per day to help support a high protein diet. Oat Blend (Malted Oats (Barley Malt Extract, Palm Oil), Rolled Oats, Oat Flour), Protein Blend (Milk Protein, Hydrolysed Gelatine, Whey Protein Concentrate (Milk)), Humectant (Glycerine), Yoghurt Coating (8%) (Sweetener: Maltitol; Non-Hydrogenated Vegetable Fat (Palm Kernel Oil, Palm Oil, Shea Oil), Sweet Whey Powder (Milk), Yoghurt Powder (Milk), Emulsifier: Soya Lecithin; Citric Acid), Dried Glucose Syrup, Water, Sweeteners (Maltitol, Sucralose),Flavourings, Rapeseed Oil, Freeze Dried Raspberry Pieces, Salt, Acidity Regulator (Citric Acid), Colour (Caramel), Dried Apple Pieces, Antioxidant (Mixed Tocopherols). May contain Wheat, Egg, Peanuts and Nuts. Food supplements should not be used as a substitute for a varied and balanced diet and a healthy lifestyle. Store out of reach of children. Excessive consumption may cause a laxative effect. Store in a cool dry place. PhD Flapjack+ Apple & Raspberry is rated 3.0 out of 5 by 2. Rated 1 out of 5 by Tjans from Artificial taste It tastes like artificial grape flavour, is overly sweet and has the texture of chewy fudge. I couldn't eat it. Rated 5 out of 5 by Toots77 from Very sustaining A solid fulfilling bar if you miss a meal I take on golf course.